I’ve been using the free version of TripIt for years as a way to keep track of the reservation details of flights, hotels, and car rentals. It’s brilliantly simple – you take the confirmation emails that you receive when you make your reservation and simply forward it to “plans@tripit.com”. It recognizes your sender email address and automatically parses out all of the information and builds an itinerary for your trip. The beauty is that you no longer need to keep track of the reservation emails, and it doesn’t matter which airline or service you use – all of the information is extracted and stored in a common format – reservation numbers, seat assignments, record locators, contact information for the airline, etc. 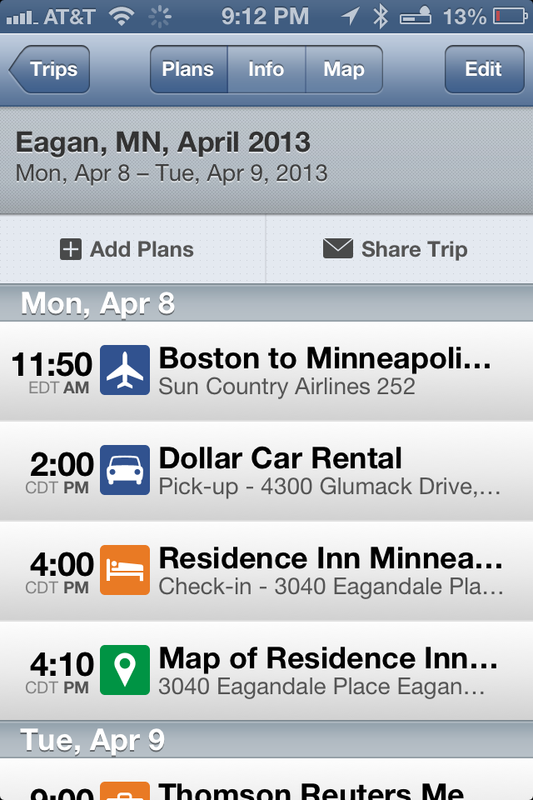 Their mobile application becomes your one-stop shop for all of your travel details. Even if you travel once or twice a year, it’s incredibly useful and costs nothing. All reservations have been organized in a consistant format and arranged into an itinerary. TripIt makes their money by offering a professional version for $50 that offers flight tracking. They will monitor all of your reservations and update information with gate information and alerts if there is a delay or cancelation. Every time I have traveled I have wished I had this feature, but I’ve always been too much of a cheapskate to sign up for it. My new job requires more travel than my old one. Not a ton, but I do have three trips for work as well as a personal vacation over the next few months, so I decided to splurge for TripIt Pro ahead of my trip to Minnesota this past Monday. As soon as I upgraded, TripIt immediately started to warn me that my return trip had a “Connection At Risk”. Our layover in Chicago was only 45 minutes, and it was alerting me to the fact that we might not make it. It also had gate numbers and airport maps, and I could see that we would have to cross half the airport to make it to our connecting flights. Well, risky was right. At least I knew what I was in for and which way to turn when we stepped off the jetway. Our trip out to Minnesota was uneventful, and as our meetings were wrapping up, we were chatting with our client about a storm expected that evening. They commented that it was a good thing we were getting out ahead of it. Naturally, my phone buzzed right at that moment with a TripIt alert. Our flight was delayed one hour, and TripIt now reported what we will definitely miss our connection. As we dashed to the airport and had an colleague back at our office looking into flight alternatives, my phone continued to buzz with updates on gate changes and schedule adjustments. As luck would have it, our Chicago flight was delayed as well, so TripIt put it back into the “Connection at Risk” category. I could also see from the airport maps that the new gate assignments were right next to each other, so there was hope. 15 minutes into the ordeal, I received an automated phone call from American Airlines about the delay, long after TripIt had sent its first notification. The airline left an automated voicemail that went on 45 seconds and was hard to piece together the information. TripIt was giving me updates much sooner and much more focused on the key data I needed to know. In the end, my boss was able to use his executive status with the airline to get our whole party bumped onto a different airline with an on-time direct flight, so we never had to find out whether we would make it through the Chicago airport. 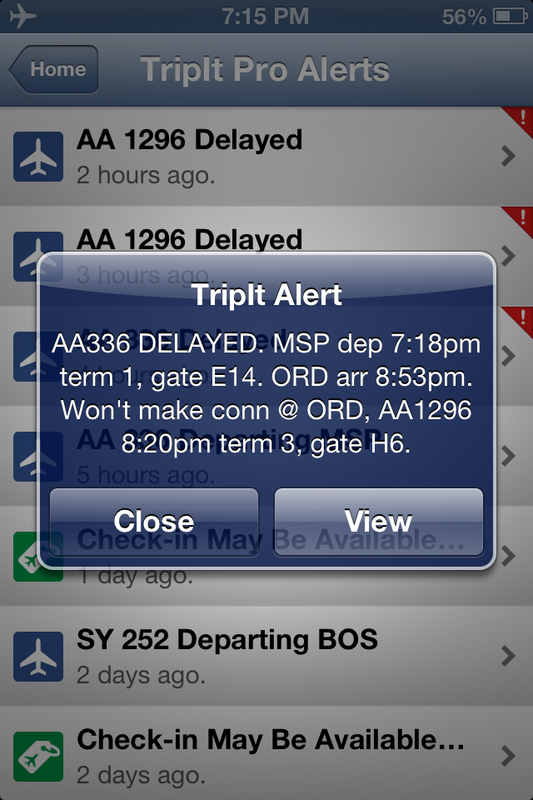 However, the fact that Tripit alerted us to the situation so early and kept us up-to-date was invaluable. It prompted my boss to work his magic and get our flights switched. Absolutely worth $50 a year. Even from a cheapskate like me. This entry was posted in Uncategorized and tagged iOS, iPhone, location services, mobile, travel. Bookmark the permalink. I ‘splurged’ on a free trial of TripIt Pro ahead of the trip I’ve just started to Phoenix. I haven’t had any of your drama, but from what I’ve seen so far, it’ll definitely be worth $50 when the trial ends. I found your post when searching for ‘tripit connection at risk’. Wait until you try to cancel Tripit. Not nearly as much fun!! You will need to file a dispute with your credit card company to accomplish this. I got complimentary TripIt Pro with my credit card (Barclaycard Arrival). So far it’s pretty great! I had a flight delayed for 55 mins. TripIt notified me LONG before the airline did. Neither my boyfriend or believed it was correct because we hadn’t heard from Southwest yet. But checking the status of the flight confirmed it. Not to mention that I just got a “Connection at Risk” status for my upcoming trip, 30 minutes between our connecting flights so let’s hope no delay! Great blog.